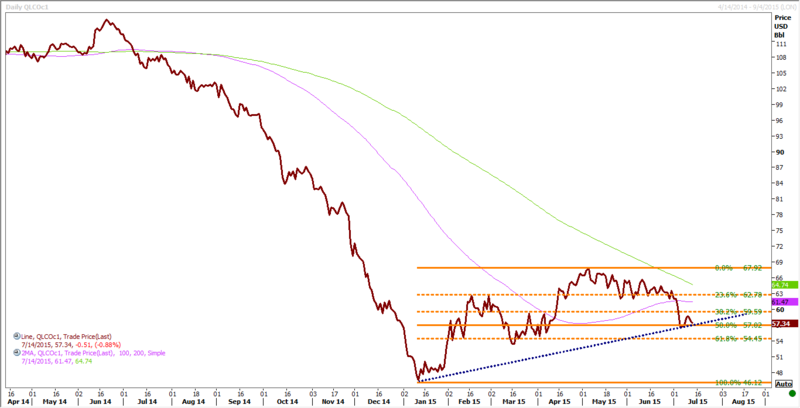 Home » Vertical » Energy » Iran Effect – Will Consumers see the Crude Touch USD 40 per Barrel? Iran Effect – Will Consumers see the Crude Touch USD 40 per Barrel? By KM Riayazuddin, Chief Finance Manager (Mumbai Refinery) | Bharat Petroleum Corp Ltd. There are two news in 1st half of July 2015 which have dominated all the newspapers of the world – one is Greece bailout package and another one is Iran package deal with P5+1 countries. Being an important member of OPEC, Iran’s deal has significant impact on the movement of oil prices. In the wake of shale oil production in the USA, the price of crude oil fell down from peak of USD 115 in June 2014 to USD 60 in June 2015. Before this news of Iran nuclear deal, crude was trading around USD 57 per barrel in ICE Exchange, London. Having got used to the lower price levels, the question now arises as to what the future holds for oil price. As per present conditions, its chances of going up are ruled out. However, its chances of going further down have brightened up. In this background, let us look at what effect Iran will have on the oil prices. Like any other product, the price of crude oil is determined by the forces of demand and supply. Global oil demand for the year 2015 is estimated to be 92.61 million barrels per day (mbpd) and it is projected to be 93.94 mbpd for the year 2016 i.e. an increase of 1.34 mbpd. On the supply side, Non-Opec countries play a significant role. As much as 57.39 mbpd of this demand is expected to be met by Non-Opec Countries in the year 2015 followed by 57.69 mbpd in the year 2016. NGL and non-conventional liquids will provide about 6 mbpd and the balance will be a call on OPEC. OPEC has produced 31.38 mbpd in the month of June 2015, out of which Saudi Arabia has contributed as much as 10.32 mbpd. These figures are quite high compared to market expectations. Thanks to shale oil revolution, US also has emerged as one of the key producer of oil reaching to an all time high figure of 9.47 mbpd. These developments give strength to the fact that there is an element of over-supply in the market. In this scenario, lifting of sanctions on Iran will open up the genie from the bottle which was kept under suppression. In order to gain excess to much required foreign exchange on immediate basis, Iran can release 36 to 37 millions barrels from its floating storage vessels. It is capable of adding up to 800 kbpd within a matter of six month to its existing production of 2.8 mbpd. There are number of countries who are eager to restore the supplies from Iran, especially, because of attractive terms of trade offered by Iran. These additional barrels will add up to the supply side sending the prices downwards. One of the significant development which has taken place during last one month is weakening of Euro as a currency. In the backdrop of Greece bailout package, Euro has taken lot of hit against dollar. A year back, it was pared at 1.33 against USD. However, it has touched down to 1.09 in recent weeks. In the basket of six major currencies which are pared together against US dollar called as “Dollar Index”, Euro is one of the currencies. Weakening of Euro gives way to strengthening of US Dollar. A year back, Dollar Index was 76 when crude oil was at USD 115 per barrel. 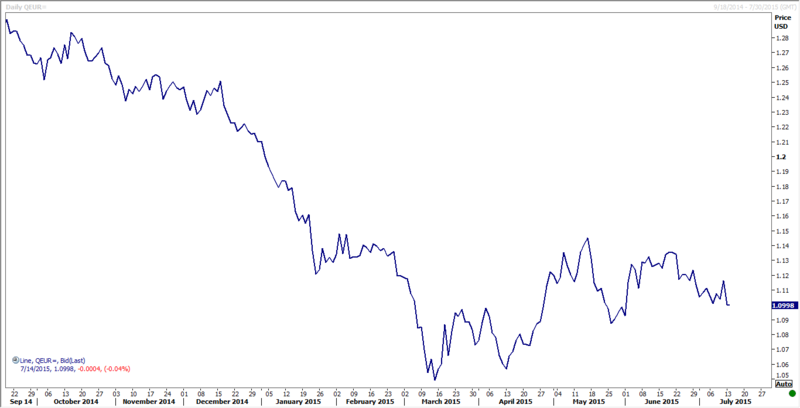 However, now Dollar Index has reached an all time high figure of 96. Crude oil price being inversely proportional to dollar strength has now settled down to USD 57 per barrel. 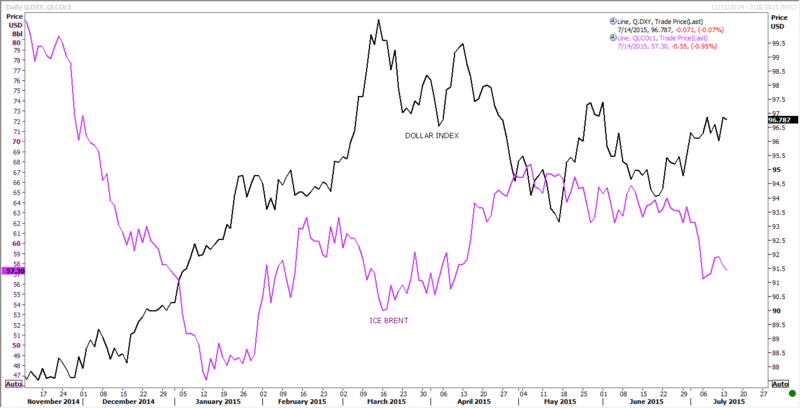 The inverse relationship between dollar strength and crude oil price is depicted in the chart below. Going forward the outlook for dollar is bright. It continues to strengthen against Rupee and major currencies. US economy has started showing the signs of recovery, having suffered great setback due to Global Financial Crisis of 2008. Its GDP growth is poised to grow at 2.4% this year and already lot of indications are coming from Janet Yellen, Chairperson of US Federal Reserves that zero or low interest regime in US will shortly come to an end. If there is a movement in interest rate by 50- basis point or more, there will be flight of capital back to US. This will further enhance dollar index value and may bring set back to crude oil prices. Therefore, the chances of price touching USD 40 per barrel are quite bright. 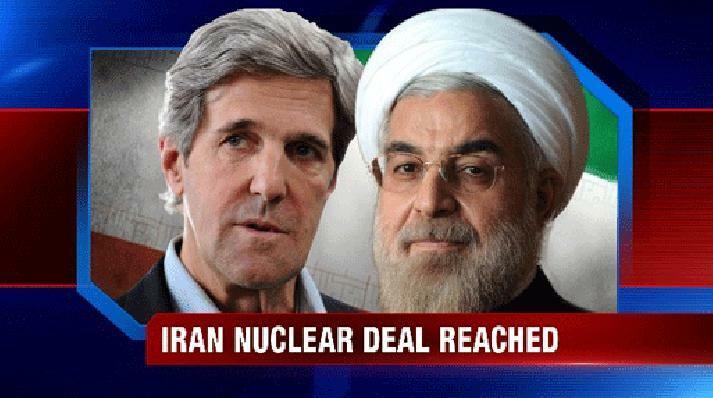 The only red herring is if US Congress does not approve the deal or Iran does something contrary to the agreement. In that case, the prices will start rebounding. The above fundamentals are supported by Technical Analysis, which helps in forecasting the future trend. As per Fibonacci projection, crude is trading at a crucial level of $57.34/bbl which is 32 cents above 50% projection level. If prices fall below this level than at immediate level i.e. 61.8% it will reach $54.45/bbl. If it breaks this level it will be under tremendous downward pressure which is close to $46.12. Let us also examine the implications of this fall on India. Iran is a major source of supply to MRPL and Essar Vadinar refineries. Lifting of sanctions will be a great boost for these refineries to go in for Iran Crude. Other refineries too will start buying Iran crude sooner or later, especially, because Iran accepts rupee payment and also offers fairly attractive terms of credit. India imports almost 189 million metric tons of crude oil in a year from different countries. If the average price falls down by USD 10 dollars, it will bring considerable relief to the balance of payment position of the country. The import bill was USD 112 billion during 2014-15. This financial year 2015-16, the import bill is estimated to come down to USD 88 billion – i.e. a significant drop of USD 24 billion which amount to almost Rs. 1,50,000 crores. This is definitely a great relief to the nation. Let us also see what is its impact on oil companies. Upstream companies like ONGC and Cairn will be hit hard due to fall in prices of crude oil prices. This is obvious as they would be getting much lesser realization from oil companies . However, ONGC will have a silver lining in the sense it stands to gain on bagging drilling contracts in Iran. The impact on oil marketing companies has to be seen in the light of price of petroleum products. Middle Distillates constitute almost 55% to 60% of the yield. The prices of JetKero and Gasoil have fallen much sharper than crude oil prices. Compared to the prices JetKero Cracks and Gasoil cracks of USD 18.50 and USD 18.00 per barrel about a year back, these crack values have fallen to USD 9.50 and USD 9.00 per barrel respectively in recent weeks. Crack values represent the margin between sale price of product minus cost price of crude oil. This may be a temporary setback. However, with the onset of winter, the prices of products would harden up and the earlier margins may be restored. In any case, as oil consuming nation, fall in crude oil price is a big relief to India. Author’s note: The views expressed in the article are entire my own.